Menu › Spag's Bar & Grill ‹ For carry out & reservations call (517) 655-4888. Six oven baked breadsticks brushed with butter and herbs. Baked with mozzarella cheese add $2.99. Special blend of refried beans and seasoned ground beef baked with cheese. Topped with jalapenos, tomatoes and chives. Served with fresh tortilla chips. Crispy fries baked with cheese and topped with chives. Get them loaded with chili, smoked bacon or BBQ pulled pork for 2.25. Homemade dip baked with cheese. Served with tortilla chips. Five tender strips of white chicken breast. Served with ranch. Add steak fries or onion rings for $1.50. Homemade cottage cheese dip served with tortilla chips and salsa. Our famous pizza dough baked with mozzarella and brushed with herb and garlic butter. Served with pizza sauce. Add bacon or pepperoni for 1.00. Fresh tortilla chips with guacamole and salsa. Soup of the day - ask us what it is today! Dried cranberries, Gorgonzola cheese, toasted walnuts, red onions, and calamata olives atop fresh greens. Served with our house dressing. Sun-dried tomatoes, toasted almonds, calamata olives, and feta cheese atop fresh Romaine. Served with our house dressing. 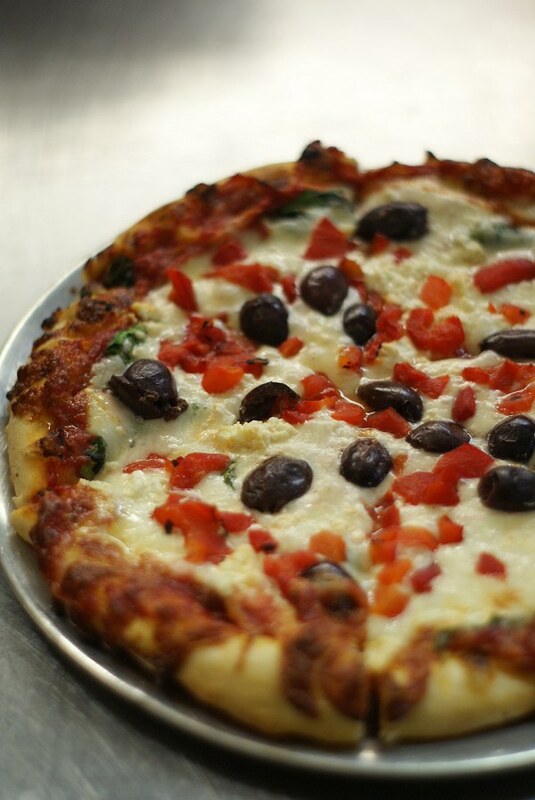 Fresh greens topped with salami, capicola, pepperoni, provolone, tomatoes, calamata olives, and red onions. Served with our house dressing. Tender slices of seasoned chicken atop fresh Romaine, red onions, plum tomatoes, and mixed cheeses. Served with our southwestern ranch dressing. Fresh greens topped with red onions, plum tomatoes, and croutons. Burger topped with ham, red onion and Gorgonzola cheese. Burger topped with sautéed mushrooms and Swiss cheese. Burger topped with hickory smoked bacon and cheddar cheese. Seasoned burger topped with sauteed onions, jalapenos and pepper jack cheese. Half pound of ground chuck grilled and loaded with your choice of toppings. Two beer battered cod filets fried and topped with cheddar. Grilled or fried chicken breast topped with BBQ sauce, smoked bacon and cheddar cheese. Fried chicken breast drenched in Franks® hot sauce. Served with bleu cheese. Choice of fried or grilled chicken breast with your choice of toppings. Burger topped with smoked bacon, fried egg, cheddar cheese, lettuce and tomato. Burger topped with slow roasted BBQ pulled pork, bacon, sauteed onion, and cheddar cheese. Smoked turkey topped with bacon, cheddar cheese, lettuce, onion and tomato. Roasted corn beef topped with sauerkraut and Swiss cheese. Served with thousand island dressing..
Smoked turkey topped with coleslaw and Swiss cheese. Served with thousand island. Salami, capicolla and ham topped with provolone, lettuce, onions, banana peppers, and tomatoes. Served with house dressing. Boneless buffalo wings, lettuce, tomatoes, onions, and shredded mixed cheese. Served with bleu cheese dressing. Stacks of turkey, ham and bacon. Topped with cheddar, lettuce, onions, and tomatoes. Shaved turkey, smoked bacon, guacamole, romaine, tomatoes and provolone cheese. Served with ranch dressing. Slow roasted pulled BBQ pork topped with house made coleslaw and cheddar cheese. Tzatziki sauce, gyro meat, feta cheese, onion, tomato and fresh spinach. Pizzas are available in regular (thick) or thin crust. Pizzas will be made with regular crust unless specified. Pizzas take 20 to 30 minutes to prepare and bake. During periods of heavy demand all food will take longer. Pizza with mozzarella and pizza sauce. Regular pizza items include: banana peppers, pineapple, jalapeno, black olives, tomatoes, mushrooms, green olives, ground beef, onion, green pepper, ham, pepperoni or Italian sausage. Pepperoni, ham, mushrooms, onions, green peppers, and green olives. Black olives may be substituted for green olives. It's the cheesiest! Our famous pizza topped with a delectable blend of fontina, Gorgonzola, provolone and mozzarella cheeses. Bleu cheese dressing, breaded chicken, red onion, banana peppers and drizzled with Franks® Buffalo Sauce. Our famous pizza topped with generous portions of pepperoni, ham, sausage and hickory smoked bacon. Grilled chicken, spinach, black olives, roasted red peppers, feta and mozzarella cheeses. Pizza sauce, mozzarella cheese, and your favorite items (extra) sandwiched between our famous crusts. Ham, hickory smoked bacon, pineapple and onion. Homemade alfredo sauce and mozzarella cheese. Then add your favorite items (extra). Calzones take 20 - 30 minutes to prepare and bake. During periods of heavy demand, calzones will take longer. Regular calzone items include: banana peppers, pineapple, jalapeno, black olives, tomatoes, mushrooms, green olives, ground beef, onion, green pepper, ham, pepperoni or Italian sausage. Specialty calzone items include: artichoke hearts, fresh spinach, grilled chicken, fresh mushrooms, sun-dried tomatoes, fresh sausage, roasted red pepper, anchovies, calamata olives, broccoli, Fontina cheese, roasted garlic, smoked bacon, Provolone cheese, double mozzarella, Gorgonzola cheese, feta cheese, capicolla, and ricotta cheese (calzone only). Generous portions of pepperoni, ham, smoked bacon, sausage and mozzarella cheese. Shaved ham, smoked bacon, pineapple, onions and mozzarella cheese. Mayonnaise, smoked bacon, and mixed cheese. Topped with lettuce and tomato. Pizza sauce, mozzarella cheese and your favorite items (extra). Then we top it with extra sauce and cheese . BBQ sauce, chicken, fresh mushrooms, onions, red peppers, and mixed cheese. Homemade alfredo sauce and mozzarella cheese. Add your favorite items (extra). Tzatziki sauce, gyro meat, feta cheese, red onion, tomato and fresh spinach. Flat Bread rolled and layered with capicolla, pepperoni, salami, provolone and mozzarella cheese. Brushed with garlic butter and served with pizza sauce on the side. Cavatappi pasta tossed with roasted red peppers, fresh mushrooms, and red onions in a spicy alfredo sauce. Topped with seasoned grilled chicken. Served with soup or salad. Three fried beer battered cod filets served with fries and your choice of coleslaw, soup or salad. A jumbo wet burrito filled with refried beans and your choice of seasoned ground beef, chicken, or BBQ pulled pork. Baked with cheese and enchilada sauce. Topped with lettuce, tomatoe, jalapeno, black olives and chives. Served with tortilla chips. Cavatappi pasta tosse with smoked bacon, fresh mushrooms, red onions, egg, garlic, cream and Romano cheese. Served with you choice of soup or salad. Eight ounce sirloin steak charbroiled to perfection. Served with either fries, onion rings, tater tots coleslaw and a cup of soup or salad.